The most perceptible reason why sweat glands change their activity over time is body thermoregulation. During a hot day or a hard workout, the body will start to visibly sweat to maintain a constant body temperature. 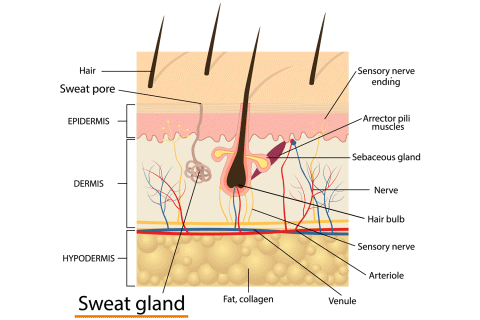 However, this is not the only reason why our sweat glands change their level of activity. The sweat glands are controlled by the sympathetic nervous system (SNS), a subdivision of the autonomic nervous system (ANS), responsible for the “fight-or-flight response”. Every time our body perceives a sensory stimulus that could change our resting state, the SNS automatically activates a physiological response that includes an acceleration of the heart rate, dilation of the pupils and increase sweat gland activity. This autonomic response is triggered by any type of emotional reaction—such as surprise, fear or anger—or when we are under stress. The SNS regulates the physiological response according to the intensity of the emotion. That is, the more intense the emotion, the higher the physiological reaction triggered by the SNS. In short, changes in the conductivity of the skin can be due to a thermoregulation process or, more interestingly for behavioral research, to nonconscious changes in emotional arousal. A GSR sensor can measure very subtle changes in electrical conductivity. This means it is possible to measure with GSR changes triggered by emotional stimulation without any noticeable sweating. To understand what GSR can and cannot measure, it is important to note that positive and negative emotions will elicit a GSR response, i.e., a very joyful moment and a very sad moment will increase the skin conductivity. GSR provides a measure of the intensity of an emotion, but does not provide any explicit information of the type of emotion (positive or negative). The figure above shows a section of the human skin and an example of one type of sweat gland. Learn the recommended locations of the body to place the GSR electrodes.